Voltaire called her his ‘adorable nightingale’. For d’Aquin, she was an enchanted being. Marie Fel was the soprano who held an entire generation spellbound at the Paris Opéra and at Louis XV’s court during one of the most glorious periods of French music. With a voice described as ‘pure, charming, silvery’ (La Borde), ‘touching and sublime’ (Grimm) and ‘always lovely, always seductive’ (d’Aquin), she inspired some of Jean-Philippe Rameau’s finest music and introduced a whole new level of virtuosity and expression into the French singing tradition. Marie Fel was born on 24 October 1713 in Bordeaux, where her father was an organist. At the age of twenty, she was talent-spotted by an agent from the Paris Opéra along with her brother, who was also a singer. She made her debut at the Académie royale de musique (as the Opéra was officially known) on 29 October 1734, taking the role of Venus in the Prologue to Louis Lacoste’s Philomèle, a tragédie en musique first performed in 1705 and enjoying its third revival. At the start of the Prologue, the goddess sings a moving plainte, ‘Ah! quand reviendront nos beaux jours?’ (track 1), in which she laments the absence of Peace. The musical style takes us back almost to the beginnings of French opera, established by Jean-Baptiste Lully in the 1670s. Indeed, there is little in Lacoste’s setting that would sound out of place in a Lullian opera. Venus’s vocal line, with scarcely a hint of distracting vocal display, adopts the expressive rise-and-fall of a sensitive declamation of the text, enhanced by a sumptuous accompaniment of five-part strings and by the choral interjections of her attendants, the Pleasures, Graces and Sports. Soon after her debut, Marie Fel began lessons with the distinguished Italian soprano Christina Somis (1704–1783), who had arrived in Paris in 1734. From Somis she learned an Italian style of singing that equipped her with a technical facility hitherto unrivalled among French singers. Her roles for the next few years were nevertheless exclusively secondary ones: at this stage, contemporary reports emphasize her singing ability rather than her acting. Indeed, it was not until 1745 that Marie was given a major dramatic part, when she appeared as the magnificently zany La Folie in Rameau’s Platée. The extent of Marie’s newly developed virtuosity is nicely illustrated in an ariette from this opera, ‘Amour, lance tes traits’ (track 10). Here a somewhat embarrassed Momus, disguised as Cupid and carrying a bow and arrow ‘d’une grandeur ridicule’, is exhorted by La Folie to empty his quiver. This ariette is a fine example of a new kind of French aria, thoroughly Italianate in its bravura vocalises and long-held notes demanding consummate breath control. Marie revived the role in 1749 and again in 1754. For Marie Fel the role of La Folie proved a turning point, since it evidently convinced the management that she was capable of taking major dramatic parts. From then until her retirement from the Opéra in 1758, Marie created almost all the principal female roles in new works; she also took the leading parts in revivals of existing operas, as in Rameau’s Castor et Pollux (1737) at its 1754 revival. In this work, the powerful soliloquy ‘Tristes apprêts’ (track 9), with its sparse vocal line and sombre accompaniment of obbligato bassoons and strings, demands a rare dramatic intensity, as the bereft Télaïre renounces the light of day in response to the death of her beloved Castor. 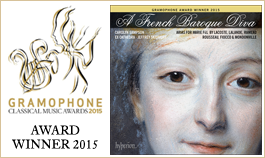 For Berlioz, this was ‘one of the most sublime conceptions of dramatic music’. D’Aquin records that Marie Fel ‘sings Italian and Provençal like Mlle Faustine when she was in her prime’. (The reference is to Handel’s prima donna Faustina Bordoni.) Marie’s origins in the south of France made her an ideal choice for the female lead in Daphnis et Alcimadure, an opera by Mondonville on a libretto written in Occitan, the language of the composer’s native Languedoc. Mondonville’s charming pastorale languedocienne was commissioned for performance in the presence of Louis XV at Fontainebleau in 1754. As the aria ‘Gasouillats auzeléts’ (track 11) reveals, the composer knew how to exploit Marie’s unrivalled ability to evoke the singing of birds. A year before she retired from the Opéra, Marie Fel took part in the 1757 revival of Rameau’s Les surprises de l’Amour, originally written for a production in Madame de Pompadour’s private theatre at Versailles in 1748. For this revival, Rameau replaced the role of Amour (Cupid) with a special part for Marie. Here she plays the Siren Parthenope, who devises a plan to trick her rival, the Muse Urania. In a divertissement (tracks 16-20) beginning ‘Accordez vos sons et vos pas’, Parthenope summons her attendant Sirens to cast a spell on her lyre that will make the severe Urania sensitive to love. This scene provides Rameau with an opportunity to indulge in some colourful orchestral effects, notably the use of multiple-stopped pizzicato chords to represent the plucking of the lyre. Alongside her operatic career, Marie Fel also excelled as a concert soloist. Less than a week after her first appearance at the Opéra, she made her debut at the Concert Spirituel, the institution that presented sacred and instrumental music on religious festivals when opera was forbidden. On 1 November 1734 she took part in Exsurgat Deus, a motet à grand chœur by Michel-Richard de Lalande, Louis XV’s chapel master. The fifth movement of this work, ‘Regna terrae’ (track 2), provided Marie with the perfect ‘star’ vehicle for her debut: against a joyous choral backdrop, the singer projects a series of increasingly virtuosic solo episodes of a kind that ideally suited her ‘admirable precision and unique agility’ (d’Aquin). Lalande’s motets proved immensely popular at the Concert Spirituel. 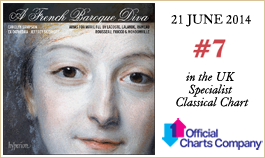 In creating what is sometimes (misleadingly) known as the ‘Versailles motet’, with soloists, chorus and orchestra, Lalande had established a counterpart to Lully’s tragédie en musique, these two uniquely French genres being regarded as emblems of the nation’s musical identity. During her thirty-five-year career at the Concert Spirituel, Marie Fel took part in innumerable performances of these works, among them the famous Te Deum laudamus (tracks 3-5), notable not only for its pomp and splendour but also for its rapt setting of the verse ‘Tu ad liberandum suscepturus hominem’. Much the most popular, however, was Lalande’s Cantate Domino, performed there at least sixty-five times. It was in this work, indeed, that Marie bade her farewell to the Concert Spirituel, on Christmas Day 1769. She chose to go out with a bang: the virtuoso fifth movement of this work, ‘Viderunt omnes termini terrae’ (track 21), is especially memorable for the passages in which the voice spars playfully with a solo oboe and bassoon. In 1752 Marie Fel came into contact with the renowned philosopher Jean-Jacques Rousseau. His one-act opera Le devin du village, in which she took the principal female role, proved a smash-hit at the French court, and Rousseau was so taken by her voice that he composed a Salve regina (tracks 6-8) for her to sing at the Concert Spirituel that same year. The Mercure de France enthused about this thoroughly Pergolesian piece and its performance: Mlle Fel sang it ‘as she alone knows how to sing. Much tunefulness and expression have been found in this motet, and connoisseurs hope that Mr Rousseau will continue to enrich secular and sacred music with his works’. Marie was especially renowned for her interpretation of music by foreign composers. One perennial favourite at the Concert Spirituel was Joseph Hector Fiocco’s buoyant setting of the psalm Laudate pueri (tracks 12-14), which she first performed on 8 December 1750 and, thereafter, every year until 1763, always ‘with that good taste, that agility and precision which render her so superior in her art’. The original set of performing parts survives, one of them including her own ornamentation markings, which have been taken into account in the present recording. In 1752, the German philosopher Melchior von Grimm attended a performance of Mondonville’s motet Venite, exsultemus at the Concert Spirituel. So smitten was he with this work that he dashed off a letter to the Mercure de France: ‘I have just heard the most beautiful piece of declamation in existence—the solo ‘Venite, adoremus’, sung by Mlle Fel in a sublime and celestial manner, as befits the way it is composed.’ Indeed, in this movement (track 15), with its magical duet between voice and flute, Mondonville had discovered a transcendent register of expression, one that was ideally suited not only to the reflective text but also to Marie’s way of singing. A similar mood returns in ‘Hodie si vocem’ (track 22) from the same motet, enhanced this time by the devoutly restrained contribution of the chorus, to generate in its three-minute span a veiled intensity to which mere words can scarcely do justice. Voltaire l’appelait son «très-aimable rossignol». Pour d’Aquin, elle était «cette fée». Marie Fel fut, à l’Opéra de Paris comme à la cour de Louis XV, la soprano qui envoûta toute une génération pendant l’une des plus glorieuses périodes de la musique française. Douée d’une voix «charmante, pure, argentine» (La Borde), «aussi touchante que sublime» (Grimm) et «toujours belle, toujours séduisante» (d’Aquin), elle inspira à Rameau certaines de ses plus belles musiques et insuffla au chant français un niveau de virtuosité et d’expression totalement neuf. Née le 24 octobre 1713 à Bordeaux, où son père était organiste, Marie Fel avait vingt ans quand un agent de l’Opéra de Paris la repéra en même temps que son frère, également chanteur. Pour ses débuts à l’Académie royale de musique (ainsi appelait-on officiellement l’Opéra), le 29 octobre 1734, elle incarna Vénus dans le Prologue de Philomèle, une tragédie en musique de Louis Lacoste qui en était à sa troisième reprise depuis sa création en 1705. Au début du Prologue, la déesse chante une émouvante plainte, «Ah! quand reviendront nos beaux jours?» (piste 1), où elle déplore l’absence de la Paix. Le style musical nous ramène presque aux débuts de l’opéra français instauré par Jean-Baptiste Lully dans les années 1670, tant il est vrai que presque rien dans la mise en musique de Lacoste ne déparerait un opéra lulliste. Vénus, dont la ligne vocale recèle à peine un soupçon de démonstration distrayante, adopte l’expressive montée et descente d’une déclamation sensible du texte, rehaussée par un somptueux accompagnement des cordes à cinq parties et par les interventions chorales de sa suite (les Plaisirs, les Grâces et les Jeux). Peu après ses débuts, Marie Fel prit des leçons avec l’éminente soprano italienne Christina Somis (1704–1783), arrivée à Paris en 1734. D’elle, elle apprit un style de chant italien qui lui assura une aisance technique alors sans égale chez les cantatrices françaises. Pourtant, pendant plusieurs années, elle fut cantonnée aux rôles subalternes: à ce stade de sa carrière, les compte-rendus de l’époque mettent davantage en avant son aptitude à chanter que son jeu. Et ce fut seulement en 1745 qu’on lui confia un grand rôle dramatique: celui de La Folie, merveilleusement loufoque, dans Platée de Rameau. L’étendue de la virtuosité, encore récente, de Marie trouve une belle illustration dans une ariette de cet opéra, «Amour, lance tes traits» (piste 10), où La Folie exhorte un Momus un rien embarrassé, travesti en Cupidon armé d’un arc et d’une flèche «d’une grandeur ridicule», à vider son carquois. Cette ariette incarne à merveille une nouvelle sorte d’aria française, très italianisante en ses vocalises de bravoure comme en ses notes tenues exigeant un contrôle consommé du souffle. Marie reprit le rôle en 1749 et, à nouveau, en 1754. Pour Marie Fel, ce rôle marqua un tournant car, à l’évidence, il lui permit de convaincre la direction qu’elle pouvait assumer de grands rôles dramatiques. Dès lors, et jusqu’à son départ de l’Opéra, en 1758, elle assuma presque tous les principaux rôles féminins, qu’il s’agît de créations ou de reprises, comme celle de Castor et Pollux (1737) de Rameau, en 1754. Dans cette œuvre, le puissant soliloque «Tristes apprêts» (piste 9), à la ligne vocale raréfiée sombrement accompagnée par les bassons et les cordes obligés, requiert une rare intensité dramatique quand, déboussolée, Télaïre renonce à la lumière du jour après la mort de son bien-aimé Castor. Berlioz y vit «l’une des plus sublimes conceptions de la musique dramatique». D’Aquin rapporte que Marie Fel «chante l’italien et le provençal comme Mlle Faustine quand elle étoit bonne» (référence ici à Faustina Bordoni, la prima donna de Haendel). Marie, de par ses origines méridionales, fut l’interprète idéale du grand rôle féminin dans Daphnis et Alcimadure, un opéra au livret rédigé en occitan, la langue du Languedoc natal de son compositeur, Mondonville. Cette charmante «pastorale languedocienne» fut commandée pour être exécutée en présence de Louis XV, à Fontainebleau, en 1754. Comme le montre l’aria «Gasouillats auzeléts» (piste 11), Mondonville savait comment exploiter l’aptitude unique de Marie à évoquer le chant des oiseaux. Un an avant de se retirer de l’Opéra, Marie Fel participa à la reprise (1757) de Les surprises de l’Amour de Rameau, originellement conçu pour être joué dans le théâtre privé de Madame de Pompadour, à Versailles, en 1748. Pour cette reprise, Rameau remplaça le rôle d’Amour (Cupidon) par une partie spéciale pour Marie, dont le personnage, la sirène Parthénope, ourdit un plan pour rouler sa rivale, la muse Uranie: dans un début sous forme de divertissement, «Accordez vos sons et vos pas» (pistes 16-20), elle convoque ses servantes Sirènes et jette un sort à sa lyre, pour rendre l’austère Uranie sensible à l’amour. Cette scène est pour Rameau l’occasion de se livrer à de pittoresques effets orchestraux grâce, notamment, à des accords pizzicato (doubles et triples cordes) symbolisant le pincement de la lyre. Outre sa carrière à l’Opéra, Marie Fel excella comme soliste de concert. Moins d’une semaine après sa première apparition à l’Opéra, elle fit ses débuts au Concert Spirituel, cette institution qui proposait de la musique sacrée et instrumentale lors des fêtes religieuses, quand l’opéra était prohibé. Le 1er novembre 1734, elle participa à Exsurgat Deus, un motet à grand chœur de Michel-Richard de Lalande, le maître de chapelle de Louis XV. Le cinquième mouvement de cette œuvre, «Regna terrae» (piste 2), servit à merveille les débuts de Marie: sur un fond choral joyeux, elle projette une série d’épisodes solo toujours plus virtuoses, idéalement adaptés à sa voix «d’une précision admirable & d’une légèreté singulière» (d’Aquin). Au Concert Spirituel, les motets de de Lalande jouirent d’une immense popularité. En créant ce qu’on appelle parfois (fallacieusement) le «motet de Versailles», ce compositeur avait forgé un équivalent de la tragédie en musique lulliste, ces deux genres remarquablement français étant regardés comme les emblèmes de l’identité musicale de la nation. Durant ses trente-cinq années de carrière au Concert Spirituel, Marie Fel participa à d’innombrables exécutions de ces œuvres, dont le fameux Te Deum laudamus (pistes 3-5), qui vaut par sa pompe, sa splendeur et sa mise en musique ravie du verset «Tu ad liberandum suscepturus hominem». Mais la pièce la plus populaire fut, de beaucoup, Cantate Domino de de Lalande, donnée au moins soixante-cinq fois. Ce fut d’ailleurs dans cette œuvre que Marie fit ses adieux au Concert Spirituel, le jour de Noël 1769. Des adieux pleins d’éclat: impossible d’oublier le virtuose cinquième mouvement, «Viderunt omnes termini terrae» (piste 21), et ses passages où la voix se dispute joyeusement avec un hautbois et un basson. En 1752, Marie Fel entra en contact avec le célèbre philosophe Jean-Jacques Rousseau et tint le principal rôle féminin de son opéra en un acte, Le devin du village, qui fit fureur à la cour. Rousseau fut si impressionné par sa voix qu’il lui composa un Salve regina (pistes 6-8) qu’elle chanta au Concert Spirituel cette année-là. Le Mercure de France s’enthousiasma pour cette pièce profondément pergolesienne et pour son interprétation: Mlle Fel chanta «comme elle seule sçait chanter. On a trouvé dans ce motet beaucoup de chant et d’expression, et les Connoisseurs désirent que M. Rousseau continue à enrichir … la Musique Françoise et Latine par ses Ouvrages». Marie était particulièrement renommée pour son interprétation d’œuvres de compositeurs étrangers. L’un des airs éternellement favoris du public du Concert Spirituel était l’allègre psaume Laudate pueri (pistes 12-14) mis en musique par Joseph Hector Fiocco, qu’elle créa le 8 décembre 1750 pour ensuite le redonner chaque année jusqu’en 1763, «avec ce goût, cette légèreté et cette précision qui la rendent si supérieure dans son art». L’original du corpus des parties ayant servi à l’exécution de l’œuvre nous a été conservé avec, sur l’une d’elles, les indications d’ornementation de Marie, dont le présent enregistrement a tenu compte. En 1752, au Concert Spirituel, le philosophe allemand Melchior von Grimm entendit le motet Venite, exsultemus de Mondonville. Il en fut si ébloui qu’il troussa une lettre au Mercure de France: «Je viens d’entendre le plus beau morceau de déclamation qui existe. C’est le récit «Venite, adoremus» chanté et déclamé par Mlle Fel d’une manière sublime et céleste, c’est-à-dire convenable au caractère que l’auteur lui a donné.» Au vrai, avec ce mouvement (piste 15) et son magique duo voix/flûte, Mondonville avait découvert un registre d’expression transcendant idéalement adapté au texte méditatif mais aussi à la manière de chanter de Marie. Un climat similaire se fait sentir dans «Hodie si vocem» (piste 22), extrait du même motet mais rehaussé par la contribution toute en retenue du chœur, pour conférer à ses trois minutes une intensité voilée à laquelle les mots peinent à rendre justice. Voltaire nannte sie seine „bezaubernde Nachtigall“, d’Aquin bezeichnete sie als eine „Fee“. Marie Fel war die Sopranistin, die an der Pariser Opéra und am Hofe Ludwigs XV. in der vielleicht prächtigsten Epoche der französischen Musikgeschichte eine ganze Generation in ihren Bann schlug. Ihre Stimme wurde als „rein, charmant, silbrig“ (La Borde), „anrührend und erhaben“ (Melchior von Grimm) und „immer wunderschön, immer verführerisch“ (d’Aquin) charakterisiert. Sie inspirierte Jean-Philippe Rameau zu besonders gelungenen Werken und revolutionierte die französische Gesangstradition, indem sie mit bis dahin ungekannter Virtuosität und Ausdruckskraft auftrat. Marie Fel wurde am 24. Oktober 1713 in Bordeaux geboren, wo ihr Vater als Organist tätig war. Als sie zwanzig Jahre alt war, wurde ein Talentsucher der Pariser Opéra auf sie und ihren Bruder, der ebenfalls Sänger war, aufmerksam. Am 29. Oktober 1734 debütierte sie an der Académie royale de musique (so der offizielle Name der Opéra) in der Rolle der Venus im Prolog zu Louis Lacostes Stück Philomèle, eine Tragédie lyrique, die 1705 erstmals aufgeführt worden war und nun bereits die dritte Wiederaufnahme erfuhr. Zu Beginn des Prologs singt die Göttin einen ergreifenden Klagegesang, „Ah! quand reviendront nos beaux jours?“ (Track 1), in dem sie das Ausbleiben des Friedens beklagt. Der musikalische Stil reicht fast zu den Anfängen der französischen Oper zurück, die Jean-Baptiste Lully in den 70er Jahren des 17. Jahrhunderts begründet hatte. Tatsächlich findet sich in Lacostes Werk kaum Material, das in einer Oper Lullys ungewöhnlich klingen würde. Die Gesangslinie der Venus, in der kaum eine ablenkende vokale Zurschaustellung stattfindet, nimmt das expressive Auf-und-Ab einer feinfühligen Textdeklamation an und wird von einer üppigen fünfstimmigen Streicherbegleitung sowie von chorischen Einwürfen ihres Gefolges, so etwa der Grazien, noch erhöht. Bald nach ihrem Debüt begann Marie Fel bei der renommierten italienischen Sopranistin Christina Somis (1704–1783), die 1734 nach Paris gekommen war, Unterricht zu nehmen. Von Somis lernte sie den italienischen Gesangsstil und erlangte dadurch eine unter französischen Sängern bis dahin unerreichte technische Beherrschung. Trotzdem waren ihre Rollen in den folgenden Jahren ausschließlich zweitrangig—zu dieser Zeit wird in den zeitgenössischen Berichten ihr Gesangstalent und weniger ihre Schauspielerei hervorgehoben. Es sollte bis 1745 dauern, bis Fel mit einer dramatischen Hauptrolle betraut wurde—sie trat dann als die wunderbar skurrile La Folie in Rameaus Oper Platée auf. Die virtuose Technik der Sängerin ist in einer Ariette aus dieser Oper, „Amour, lance tes traits“ (Track 10) sehr gut dargestellt. Hier wird ein etwas verlegener Momus, der als Amor verkleidet und mit einem Pfeil und Bogen „d’une grandeur ridicule“ ausgestattet ist, von La Folie dazu angehalten, seinen Köcher zu leeren. Diese Ariette ist ein schönes Beispiel für einen neuen Typus der französischen Arie, deren bravouröse Vokalisen und nur mit geübter Atemtechnik auszuhaltende lange Noten ganz an den italienischen Stil angelehnt sind. 1749 und 1754 trat Fel nochmals als La Folie in Wiederaufnahmen der Oper auf. Jene Rolle sollte für Marie Fel ein Wendepunkt sein, da die Geschäftsleitung sich offenbar hatte überzeugen lassen, dass sie für große dramatische Rollen geeignet sei. Von diesem Zeitpunkt an inspirierte Marie Fel fast alle weiblichen Hauptrollen in neuen Werken und übernahm zudem bei Wiederaufnahmen bereits existierender Opern die Hauptrollen, bis sie sich 1758 von der Opéra zurückzog. So trat sie 1754 beispielsweise in der Wiederaufnahme der Rameau-Oper Castor et Pollux (1737) auf, in der der eindringliche Monolog „Tristes apprêts“ (Track 9), dessen karger Gesangspart zusammen mit einer gedämpften Begleitung von obligaten Fagotten und Streichern erklingt, eine seltene dramatische Intensität verlangt, wenn Télaïre auf den Tod ihres geliebten Castors hin sich vom Tageslicht abkehrt. Berlioz zufolge war dies „eine der sublimsten Konzeptionen dramatischer Musik“. D’Aquin hielt fest, dass Marie Fel „Italienisch und Provenzalisch wie Mlle Faustine in ihrer Glanzzeit“ sang, wobei er sich auf Händels Primadonna Faustina Bordoni bezog. Aufgrund ihrer südfranzösischen Herkunft war Marie Fel die ideale Besetzung für die weibliche Hauptrolle in Daphnis et Alcimadure, eine Oper von Mondonville in okzitanischer Sprache, welche in der Heimat des Komponisten, dem Languedoc, gesprochen wurde. Diese reizvolle pastorale languedocienne war für eine Aufführung in Gegenwart Ludwigs XV. in Fontainebleau im Jahre 1754 in Auftrag gegeben worden. In der Arie „Gasouillats auzeléts“ (Track 11) rückt der Komponist Marie Fels unerreichte Gabe, Vogelgesang nachzuahmen, besonders wirkungsvoll in den Vordergrund. Ein Jahr bevor sie sich von der Opéra zurückzog, nahm Marie Fel an der Wiederaufnahme von Rameaus Oper Les surprises de l’Amour von 1757 teil, die ursprünglich für eine Inszenierung in Madame de Pompadours Privattheater in Versailles im Jahre 1748 entstanden war. Für diese Wiederaufnahme ersetzte Rameau die Rolle des Amour mit einer besonderen Rolle für Marie Fel. Hier spielte sie die Sirene Parthenope, die einen Plan ausheckt, mit dem ihre Rivalin, die Muse Urania, überlistet werden soll. In einem Divertissement (Track 16-20), das mit „Accordez vos sons et vos pas“ beginnt, ruft Parthenope ihre Gefolgschaft zu sich, um ihre Leier mit einem Zauber zu belegen, der die strenge Urania liebesfähig machen soll. Diese Szene lieferte Rameau Gelegenheit, schillernde Orchesterklangfarben einzusetzen, was insbesondere in den Mehrfachgriffen im Pizzicato zum Ausdruck kommt, die das Zupfen der Leier darstellen. Neben ihrer Opernkarriere tat Marie Fel sich auch als ausgezeichnete Konzertsängerin hervor. Weniger als eine Woche nach ihrem Operndebüt trat sie erstmals im Rahmen des Concert Spirituel auf, jene Institution, die an kirchlichen Feiertagen (wenn Opern nicht aufgeführt werden durften) Konzerte mit geistlicher und instrumentaler Musik veranstaltete. Am 1. November 1734 wirkte sie in einer Aufführung von Exsurgat Deus mit, eine motet à grand chœur aus der Feder des Kapellmeisters Ludwigs XV., Michel-Richard de Lalande. Der fünfte Satz dieses Werks, „Regna terrae“ (Track 2), war die ideale „Starnummer“ für Fels Debüt—zu einem beschwingten chorischen Hintergrund hat die Solostimme eine Reihe von zunehmend virtuosen Solo-Passagen zu bewältigen, die zu ihrer „bewundernswerten Präzision und einzigartigen Gewandtheit“ (d’Aquin) ideal passten. Lalandes Motetten sollten sich beim Concert Spirituel als äußerst populär erweisen. Mit seinem Werk, das manchmal (irreführenderweise) als „Versailler Motette“ bezeichnet wird und das für Solisten, Chor und Orchester angelegt ist, hatte Lalande ein Gegenstück zu Lullys Tragédie lyrique geschaffen und diese beiden spezifisch französischen Genres wurden als Markenzeichen für die musikalische Identität des Landes betrachtet. Im Laufe ihrer 35 Jahre währenden Karriere beim Concert Spirituel wirkte Marie Fel in unzähligen Aufführungen dieser Werke mit, darunter das berühmte Te Deum laudamus (Track 3-5), welches nicht nur aufgrund seiner Pracht und Herrlichkeit bemerkenswert ist, sondern auch wegen seiner verzückten Vertonung des Verses „Tu ad liberandum suscepturus hominem“. Mit Abstand am beliebtesten war jedoch Lalandes Cantate Domino, das mindestens 65 Mal aufgeführt wurde. Dieses Werk war es auch, mit dem Marie Fel am Ersten Weihnachtsfeiertag 1769 vom Concert Spirituel Abschied nahm. Sie hatte sich für ein aufwendiges Lebewohl entschieden—der virtuose fünfte Satz dieses Werks, „Viderunt omnes termini terrae“ (Track 21) ist aufgrund der Passagen, in denen die Singstimme sich spielerisch mit einer Solo-Oboe und Fagott zankt, besonders denkwürdig. Marie Fel war für ihre Interpretationen von Werken ausländischer Komponisten besonders berühmt. Ein „Dauerbrenner“ beim Concert Spirituel war die lebhafte Vertonung des Psalms Laudate pueri (Track 12-14) von Joseph Hector Fiocco, die sie erstmals am 8. Dezember 1750 sang und darauf jedes Jahr bis 1763, und stets „mit jenem guten Geschmack, jener Gewandtheit und jener Präzision, die sie in ihrer Kunst so überlegen machen“. Das ursprüngliche Notenmaterial ist überliefert, wobei in einer Stimme ihre eigenen Ornamente eingeschrieben sind, die bei der vorliegenden Einspielung entsprechend berücksichtigt wurden. 1752 hörte der deutsche Schriftsteller Melchior von Grimm eine Aufführung von Mondonvilles Motette Venite, exsultemus im Rahmen des Concert Spirituel. Er war von dem Werk so derart begeistert, dass er einen Brief an den Mercure de France schrieb, in dem es heißt: „Ich habe soeben das wunderschönste Stück Deklamation gehört, das es gibt. Es ist das Solo «Venite, adoremus», gesungen und deklamiert von Mlle Fel in sublimer und himmlischer Weise, das heißt, dem Charakter entsprechend, den der Komponist dem Stück verliehen hat.“ Tatsächlich hatte Mondonville in diesem Satz (Track 15), mit seinem zauberhaften Duett zwischen Singstimme und Flöte, ein überweltliches expressives Register gefunden, das nicht nur ideal zu dem besinnlichen Text, sondern auch zu Marie Fels Gesangsstil passte. Eine ähnliche Stimmung stellt sich in „Hodie si vocem“ (Track 22, aus derselben Motette) ein, was hier noch durch den andächtig-zurückhaltenden Beitrag des Chors verstärkt wird und so in der dreiminütigen Dauer eine verschleierte Intensität erreicht, die kaum in Worte zu fassen ist. What is the origin of Ex Cathedra’s love affair with French Baroque music? It may simply come from a love of France and Gallic flair. It may be more deep-rooted than that. Perhaps it goes back to the 1950s when the comforting music of Fauré’s Dolly closed the BBC broadcast Listen with Mother. My undergraduate conducting debut in Oxford in 1972 was a performance of Machaut’s medieval masterpiece the Messe de Nostre Dame. Ex Cathedra’s first orchestral concert in Birmingham in the late 1970s included Fauré’s Requiem. Since these early days we have explored repertoire by Le Jeune, Bouzignac, Charpentier and Du Mont, by Lully, Lalande, Rameau, Mondonville and Royer, by Saint-Saëns, Debussy and Ravel, and by Messiaen, Poulenc, Duruflé, Lesur, Villette and Hakim. Quite a love affair! 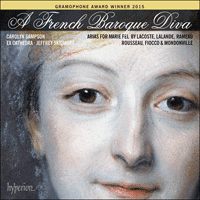 Ex Cathedra returns in this recording to its beloved French Baroque repertoire with a sensual selection of sacred and secular music by Lalande, Mondonville and Rameau, to celebrate the Enlightenment heroine Marie Fel with Carolyn Sampson in the title role. Following the career of one extraordinary eighteenth-century singer it is possible to demonstrate the complete history of the glorious music written in the Ancien Régime in the years running up to the Revolution. This is great music and a great story. I designed this programme for Ex Cathedra, Margaret Faultless, the eminent leader of Ex Cathedra’s Baroque Orchestra, and Carolyn Sampson, who sang with Ex Cathedra as a student in Birmingham in the 1990s. We are very proud that Carolyn is now widely regarded as one of the finest early music sopranos and has been described as ‘one of the wonders of the operatic world’. Marie Fel was the darling of Enlightenment Paris in the eighteenth century—the ‘adorable nightingale’. Audiences ‘ran to the opera’ when she was singing. She was described as a ‘secret joy’. Unanimous praise was lavished on her throughout her thirty-five-year career and panegyrics abound in the memoirs, confessions, poetry and letters of the famous, including Voltaire, Casanova, Jean-Jacques Rousseau, Baron Grimm, Louis de Cahusac, Charles Collé and Quentin de La Tour, the artist of her exquisite, pastel portrait. Much is known about Marie Fel’s performing career. Many part-books survive with her name at the top of the page and with hand-written ornaments. Fiocco’s Laudate pueri is an example and a full score and instrumental parts survive with cuts clearly marked and the names of leading players of the day on each part, giving a useful insight into the balance of Marie Fel’s orchestra in the 1750s. This recording begins with her stage and concert debut in 1734 and ends with her final stage appearance in a Rameau opera in 1758 and her final appearance in a Concert Spirituel in 1769. At the heart of the recording is one year—1754—when Marie Fel was in her early forties at the peak of her career. In that single year she revived roles in two Rameau operas, gave the premiere of a Languedoc opera by Mondonville and many performances of the three sacred pieces by Rousseau, Fiocco and Mondonville which were to define her wide popularity. I have been researching this programme, mildly obsessively, for several years. Many people have helped me prepare the performing material. I should particularly like to thank Professor Graham Sadler, Pascal Duc, Adrian Horsewood and Patrick Dunachie for their invaluable assistance. I would also like to thank Father Guy Nicholls and Jules Whicker for their help with the translation of Latin and French texts respectively, Marta Simó-Comas for her guidance in the pronunciation of Languedoc, and Nicole Tibbels as our inspirational French coach. D’où vient la passion d’Ex Cathedra pour la musique baroque française? Simplement, peut-être, d’un amour de la France et du style français. À moins que les racines ne soient plus profondes que cela et qu’il faille remonter aux années 1950, quand la réconfortante musique de Dolly, la suite de Fauré, venait clore le programme Listen with Mother, sur la BBC. En 1972, encore étudiant, ce fut avec la Messe de Nostre Dame, chef-d’œuvre médiéval de Machaut, que je fis mes débuts de chef, à Oxford. Et le Requiem de Fauré figurait au programme du premier concert orchestral d’Ex Cathedra à Birmingham, à la fin des années 1970. Depuis, nous avons exploré les répertoires de Le Jeune, Bouzignac, Charpentier et Du Mont, de Lully, de Lalande, Rameau, Mondonville et Royer, de Saint-Saëns, Debussy et Ravel mais aussi de Messiaen, Poulenc, Duruflé, Lesur, Villette et Hakim. Une vraie passion! Ex Cathedra renoue ici avec son cher répertoire baroque français à travers une sélection sensuelle de pièces sacrées et profanes de de Lalande, Mondonville et Rameau pour célébrer l’héroïne du Siècle des Lumières que fut Marie Fel avec, dans le rôle-titre, Carolyn Sampson. Suivre ainsi la carrière d’une extraordinaire chanteuse du XVIIIe siècle nous permet de parcourir toute l’histoire de la glorieuse musique écrite sous l’Ancien Régime, jusqu’à la Révolution. C’est de la grande musique et une grande histoire. Ce programme, je l’ai conçu pour Ex Cathedra, pour Margaret Faultless, l’éminent premier violon de l’Orchestre baroque d’Ex Cathedra, et pour Carolyn Sampson, qui chanta avec Ex Cathedra alors qu’elle était étudiante à Birmingham, dans les années 1990. Nous sommes très fiers qu’elle soit désormais largement reconnue comme l’une des meilleures sopranos de musique ancienne, comme une «merveille du monde de l’opéra». Marie Fel fut la coqueluche—le «très-aimable rossignol»—du Paris des Lumières. Le public «se pressait à l’opéra» quand elle y chantait. Elle était une «joie secrète». Durant ses trente-cinq ans de carrière, elle fut couverte de louanges unanimes et les dithyrambes abondent dans les mémoires, confessions, poèmes et lettres de gens illustres tels Voltaire, Casanova, Jean-Jacques Rousseau, le baron Grimm, Louis de Cahusac, Charles Collé et Quentin de La Tour, l’auteur de son exquis portrait au pastel. La carrière d’interprète de Marie Fel est richement documentée. Quantité de parties séparées nous ont été conservées, avec son nom en haut de la page et des ornements manuscrits. Pour Laudate pueri de Fiocco, par exemple, nous disposons d’une grande partition et des parties instrumentales avec des coupes clairement marquées et, sur chaque partie, les noms des grands interprètes de l’époque, ce qui nous donne un utile aperçu de l’équilibre de l’orchestre de Marie Fel dans les années 1750. Cet enregistrement s’ouvre sur ses débuts sur scène et au concert, en 1734, pour s’achever sur ses adieux à la scène (dans un opéra de Rameau, en 1758) et au Concert Spirituel, en 1769. Au cœur de cet enregistrement, il y a une année, 1754: Marie, alors la quarantaine, était à l’apogée de sa carrière. Dans cette seule année, elle reprit les rôles de deux opéras de Rameau, créa un opéra languedocien de Mondonville et interpréta maintes fois les trois pièces sacrées de Rousseau, Fiocco et Mondonville qui allaient faire son immense popularité. Wie erklärt sich die besondere Beziehung des Ensembles Ex Cathedra zur französischen Barockmusik? Sie mag einfach von einer Liebe zu Frankreich und zum gallischen Flair stammen. Möglicherweise hat sie jedoch noch tiefere Wurzeln—vielleicht reicht sie in die 1950er Jahre zurück, als die beruhigende Musik aus Faurés Dolly Suite die BBC-Sendung Listen with Mother beendete. Mein Dirigierdebüt als Student machte ich 1972 in Oxford mit einer Aufführung von Machauts mittelalterlichem Meisterwerk, der Messe de Nostre Dame. Auf dem Programm des ersten Orchesterkonzerts Ex Cathedras gegen Ende der Siebziger Jahre in Birmingham stand unter anderem das Requiem von Fauré. Seitdem haben wir uns Repertoire von Le Jeune, Bouzignac, Charpentier und Du Mont, von Lully, Lalande, Rameau, Mondonville und Royer, von Saint-Saëns, Debussy und Ravel, sowie von Messiaen, Poulenc, Duruflé, Lesur, Villette und Hakim erarbeitet. Durchaus eine besondere Beziehung! Mit der vorliegenden Einspielung wendet Ex Cathedra sich seinem geliebten französischen Barockrepertoire zu, wobei eine sinnliche Auswahl geistlicher und weltlicher Musik von Lalande, Mondonville und Rameau präsentiert und eine Heldin der Aufklärung, Marie Fel, mit Carolyn Sampson in der Titelrolle gefeiert wird. Indem wir die Karriere einer außergewöhnlichen Sängerin des 18. Jahrhunderts nachzeichnen, kann die vollständige Musikgeschichte der großartigen Musik des Ancien Régime der Jahre kurz vor der Revolution dargestellt werden. Es ist dies großartige Musik und eine großartige Geschichte. Ich habe dieses Programm für Ex Cathedra, Margaret Faultless, die renommierte Konzertmeisterin des Barockorchesters von Ex Cathedra, und Carolyn Sampson entworfen, die in den 90er Jahren als Studentin in Birmingham ein Mitglied von Ex Cathedra war. Wir sind sehr stolz darauf, dass Carolyn Sampson inzwischen als eine der führenden Sopranistinnen Alter Musik betrachtet wird und zu einem „Wunder der Opernwelt“ erklärt worden ist. Marie Fel war der Liebling des Paris der Aufklärung im 18. Jahrhundert—die „bezaubernde Nachtigall“. Das Publikum „rannte in die Oper“ wenn sie auftrat. Sie war eine „geheime Freude“. Während ihrer 35-jährigen Karriere wurde sie stets mit einstimmiger Anerkennung überhäuft und es finden sich zudem zahlreiche Lobpreisungen in den Memoiren, Bekenntnissen, Gedichten und Briefen der Berühmten, darunter Voltaire, Casanova, Jean-Jacques Rousseau, Melchior von Grimm, Louis de Cahusac, Charles Collé und Quentin de La Tour, der Maler ihres exquisiten Pastell-Porträts. Marie Fels Künstlerkarriere ist gut dokumentiert. Es ist viel Notenmaterial überliefert, das mit ihrem Namen versehen ist und in dem sich handgeschriebene Ornamente finden. Das Laudate pueri von Fiocco ist ein solches Beispiel, wobei zudem die Partitur und Orchesterstimmen überliefert sind, in denen Kürzungen sowie die Namen der wichtigsten Orchestermusiker entsprechend der jeweiligen Aufführungen angegeben sind, was einen interessanten Einblick in die Zusammensetzung von Marie Fels Orchester der 1750er Jahre bietet. Die vorliegende Aufnahme beginnt mit ihrem Bühnen- und Konzertdebüt im Jahre 1734 und endet mit ihrem letzten Bühnenauftritt in einer Rameau-Oper im Jahre 1758 und ihrem letzten Auftritt im Rahmen des Concert Spirituel im Jahre 1769. Im Zentrum der Einspielung befindet sich das Jahr 1754, als Marie Fel sich mit Anfang Vierzig am Höhepunkt ihrer Karriere befand. In diesem einen Jahr wirkte sie in Wiederaufnahmen von zwei Rameau-Opern mit, gab die Premiere einer okzitanischen Oper Mondonvilles sowie zahlreiche Aufführungen der drei geistlichen Werke von Rousseau, Fiocco und Mondonville, die ihre weitreichende Popularität definieren sollten.